President Muhammadu Buhari on Monday night hosted State Governors and Senators-elect of the All Progressives Congress to a dinner at the new Banquet Hall of the Presidential Villa, Abuja. 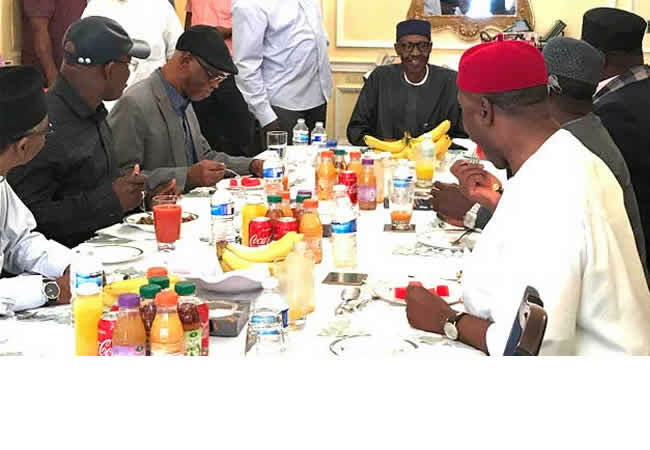 The News Agency of Nigeria reports that those in attendance included the National Chairman of the APC, Comrade Adams Oshiohmole; Secretary to the Government of the Federation, Mr. Boss Mustapha, and other presidential aides. Prominent among the prospective contestants for the Senate leadership are Ahmed Lawan, Danjuma Goje and Ali Ndume all from Northeast zone of the country and Abdullahi Adamu from the North Central zone. NAN reliably gathered that the APC zoning formula for the election of a new Senate President for the 9th National Assembly may be part of the issues to be deliberated upon at the dinner.